Diasporic Literature is a broad term applicable to all types of literary work written by authors who live outside of their native country though their work comprise of the references to authors’ native culture. Multiple identities, cultural ties and national affiliation are commonly featured is such literary works. During the 6th night of the See You in Iran’s migration event series at our cultural house, we are hosting Neda Shoaei and Soroush Aa’hi who within their projects (Hier und Jetz residency and BLO Ateliers) and collaborations are after familiarizing the public with authors, thinkers and artists who are concerned or involved with diasporic literature. 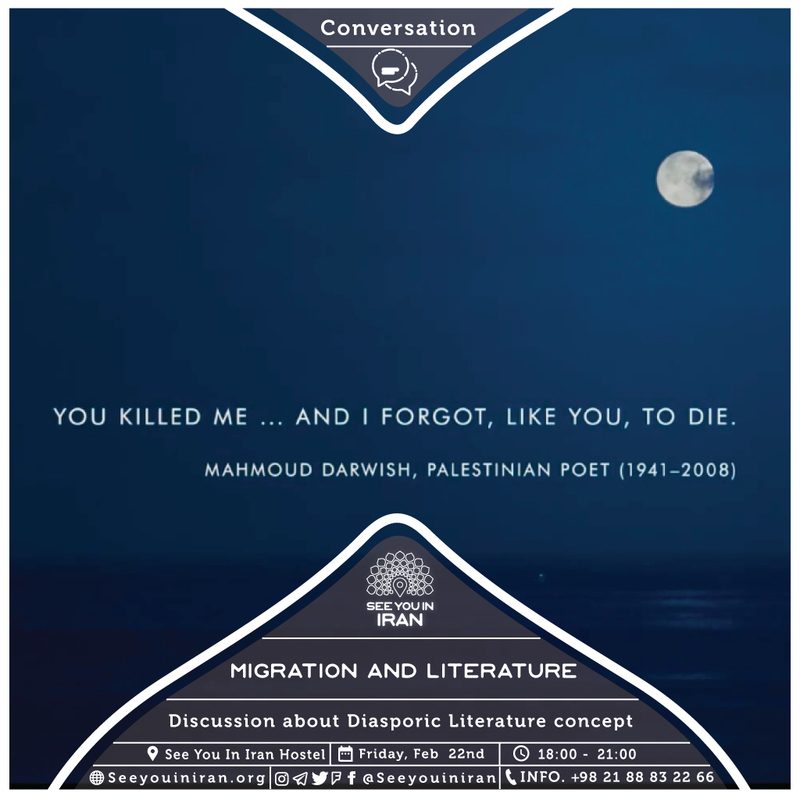 Join us for a discussion regarding the topic on Friday, 22nd of February at See You in Iran Cultural House and Hostel in Tehran at 6:00 PM. ادبیات دیاسپورا (مهاجرت) به مفهومی وسیع از آثار ادبی که توسط نویسندگانی که خارج از سرزمین مادری خود تولید می‌شوند، اشاره دارد. آثاری که بیانگر هویت‌های چندگانه، پیشینه‌ی فرهنگی و وابستگی‌های ملی می‌باشد. در شب ششم از سری رویدادهای مهاجرت در خانه فرهنگی See You in Iran، میزبان ندا شعاعی و سروش آهی خواهیم بود تا به بررسی مفهوم ادبیات مهاجرت و آثار برجسته آن بپردازیم. ندا و سروش با انجام پروژه‌های گوناگون و همکاری با رزیدنسی Hier und Jetz و BLO Ateliers در پی شناساندن هنرمندان، نویسندگان و متفکران به همراه آثار آنها در حوزه ادبیات مهاجرت می‌باشند. از شما دعوت می‌کنیم جمعه، ۳ اسفند، ساعت ۶ عصر برای شرکت در این رویداد در خانه فرهنگی See You in Iran در کنار ما باشید.